Halva is probably the quintessential favorite candy dessert in the Middle East. But the actual recipe can vary greatly from region to region and country to country. For the most part, it is a dense, sweet confection and the two most common variations are flour based halva and nut and seed based halva. Flour based halva is often more gelatinous while the nut and seed butter halva tends to be drier and have a more crumbly mouth feel. The most typical nut and seed base is sesame seed paste or tahini which is combined with sugar or honey and heavy cream . Then, it can be either flavored with vanilla or with bits of chocolate swirled throughout to create a marbled effect. It also often includes bits of pistachios. In the United States it is often sold pre-packaged in specialty stores or in freshly made blocks in gourmet and ethnic food stores. In the Middle East, however, the candy is more likely to be homemade. The flour based recipe, commonly found in Iran, Greece, Turkey, India, Afghanistan and Pakistan, uses semolina, butter and sugar and can be flavored with spices like saffron and also aromatics like rosewater. Cornstarch is sometimes used in the Greek version. Nut based halva is common in countries like Cyprus, Egypt, Israel, Iraq, Lebanon and Syria but they're almost always made with sesame seeds. Sunflower seed versions, however, are popular in eastern European countries. Tahini based halva is the one most commonly sold in the United States. In addition to being a delicious confection on its own, the halva candy makes a delicious base for a batch of chocolate brownies, an ingredient in chocolate chip cookies or as the flavoring in homemade ice cream. The recipe below is for the flour based version. It's rich and sweet and very aromatic from the addition of rosewater and saffron. 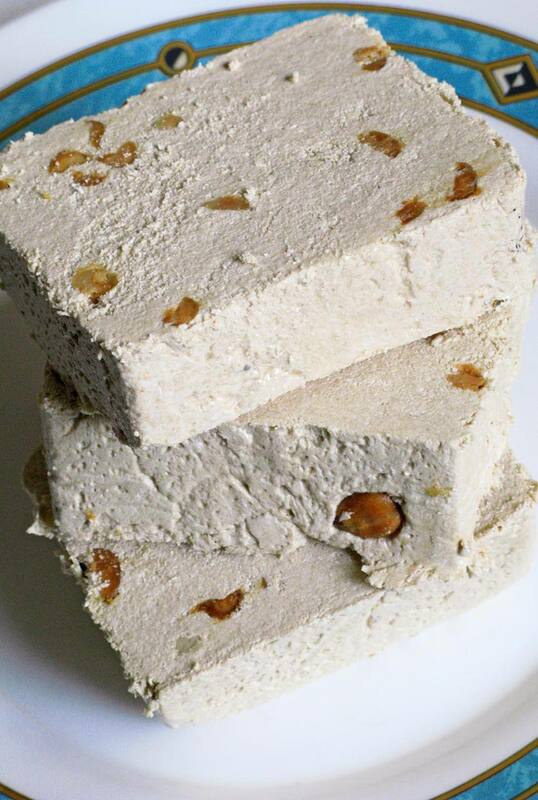 Halva is great on it's own but even better when enjoyed with a cup of coffee or tea after a meal. In a small saucepan, bring the sugar and water to a boil. Once the sugar is dissolved, add the saffron and rosewater. You will have a syrup like texture. Remove from heat. In a medium saucepan, melt the butter on medium heat. Add the flour slowly and mix with the butter to make a paste. Slowly add the sugar syrup and blend together. Remove from the heat. Immediately pour the mixture into individual ramekins or onto a serving plate. Allow to cool and either remove the halva from the ramekins or cut into small serving pieces.